Subaru 04 STI Front Axle Bar Upgrade. The STI is a very stout car, the front inner and outer CVs are very strong but the bars are not, this is a 300M bar upgrade including both bars, boots, clamps and grease. You will need to take you CV off and put them onto these bars. Be very careful when ordering the bar upgrade the axle from year to year are interchangeable but the internal spline (inside the boot) are different. If youre not sure disassemble the axle and give us the spline counts. 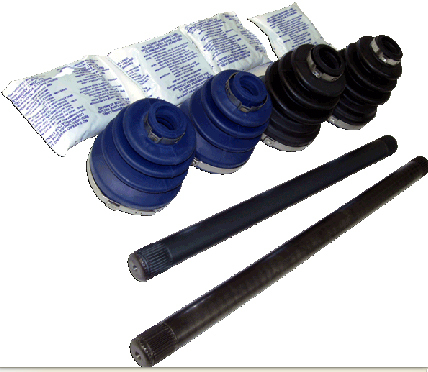 The price shown is for a kit with (2) axle bars (4) boots and (8) clamps and enough grease for all. 04 STI ONLY. Comes with 1 year warranty.